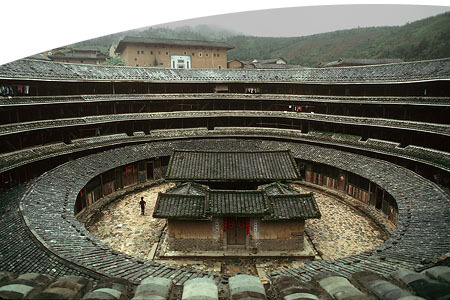 Mui's talk at our October meeting will focus on the Hakka clan houses in the Fujian province of China. The Hakka clan migrated from central China eastward and settled in the coastal region during the 17th century. The material for this lecture grew out of Mui's extensive research on vernacular architecture in China conducted during the past twenty-five years. But even earlier, as a young person visiting her home village in Southern China, she was fascinated by these non-architect designed structures and by the peacefulness and simplicity of the landscape. Prior to the normalization of diplomatic relations between China and the U.S. in the mid-seventies, Mui was continuously able to make visits to China with her family, by virtue of her Hong Kong identity papers. This also gave her access to places other than the large cities, which were still controlled by the central government and which were often off-limits to foreigners until as recently as ten years ago. China was wary of foreigners and the information they were collecting, and under this tight control the only material most foreign scholars could collect on vernacular architecture was on the courtyard houses in Beijing. As a result, for most American students, this was the extent of their information on vernacular architecture in China. Mui's visits allowed her to see not only the richness of the non-self-conscious vernacular architecture, but also its startling varieties. Her plan was to collect as much information as possible on these structures before the onslaught of modernism, and to share these findings with her many Asian students. Mui Ho earned both her B.S. and Architectural degrees at Cornell University. Since 1975 she has been a teacher of design at the Department of Architecture at the University of California, Berkeley. Her research in China began as part of her teaching and course development for her seminar class in Regional Architecture of China. Are Design Professionals, Contractors and Building Officials fulfilling their obligations to insure Access to Persons with Disabilities within the Built Environment? More than 40 years have gone by since the first accessibility standards were in place and we still see new and remodeled buildings and facilities constructed that do not provide the required accessibility for persons with disabilities. Because of these failures, the projects are in violation of their civil rights. Since 1990 the Americans with Disabilities Act (ADA), a civil rights regulation has required that persons with disabilities have the same right as the general public to full use of public transportation, public buildings, facilities, streets, sidewalks, walkways, as well as access to their programs, services and activities. Since 1985 I started practicing architecture in California and I have observed a lack of appropriate code compliance and enforcement regarding accessibility regulations by both the design, construction and permitting communities. There is definitely a systemic problem, that the entire construction industry is not addressing as it should be the issue of providing access to building and facilities. Architects are not complying in their designs with all the applicable accessibility codes and regulations, building departments are failing to adequately enforce the regulations, plan reviewers are approving plans with code violations, field inspectors are not findings the errors and omissions in the field and contractors are also failing to comply and deliver buildings that are accessible to all. Recently you may have seen a number of news stories regarding lawsuits against cities and counties in California because of the lack enforcement of accessibility codes and regulations. The Attorney General's Office filed these lawsuits due to the numerous complaints from the disability community. Part of those lawsuits settlement agreements require those public entities to provide training about accessibility codes and regulations to their staff as well as requiring to review their internal policies and procedures to insure compliance. These policies must include a method to evaluate and monitor staff performance in a regular basis and provide on-going accessibility code training. Additionally with the passage of Senate Bill 262, the State is currently working in the development of a certification program for design professionals as well as qualified disabled access specialists. During the past three months I (Gilda Puente-Peters, Architects, Universal Design Specialists, gildapp@msn.com) have been providing comprehensive accessibility code compliance training to 70 building officials, plan reviewers and field inspectors of Contra Costa County. This is the first pilot project training using the 25 section training system developed for the Division of the State Architect by several consultants including myself. As you can see, there is the need not only to provide disabled access training at all levels, but most of all to change the attitude throughout the industry regarding access compliance. When you are involved in a project, have you ever look at it from the perspective of "Universal Design" as it should be? Universal Design entails planning for a broad range of users, with all kind of abilities. The design solutions should be simple, intuitive and easy to use with low physical effort. Accessibility codes and regulations benefit all of us throughout our life span from birth to dead. Mothers with strollers, delivery people benefit from having curb ramps and ramps, people with temporary disabilities and the aging population benefit from having handrails and elevators, and all of us benefit from having way-finding systems and a friendlier and more functional environment. It is important to realize the great responsibility of our role as professionals in shaping the built environment and the effect it can have in our communities. In order for change to take place specially one as complex as the needs of the disability community, we the professionals in the design and construction industry as well as the enforcing agencies must recognize that there is not only the need to have appropriate access code training at all levels, but also accept the need to change the attitude throughout our community to a more positive one about disability access. Please consider embracing and giving disabled access compliance a priority by incorporating it in our daily practice. The good news is that we have extended the coverage another month through the end of October The bad news is that Health Net told me today that there had been a misunderstanding about the Cobra coverage and that is would only be offered to 10 year veterans who leave the small closed group. When I told John Jakiemiec that Health Net had said this, he was extremely distressed and said he would try to get them to reverse that decision. The long and the short is that without Cobra rights for the 60 people who have been with the group for less than 10 years, the concept of the injunction to maintain the existing coverage for everyone becomes a better option. We have enough votes for the expenditure on legal representation. If you did not return your ballot, please do so because the more we have the better. 1. John and I will argue with Health Net about the Cobra rights. 2. We will obtain Health Net's proposed contract and rates for the 10 year vets group. 3. We will circulate that offer to whomever is eligible. 4. We will reassess the situation in about 2 weeks. I am much more inclined to recommend the injunction route without the Cobra rights. We would give the attorney more time to file the injunction and get a court date before the end of October if we start that process in about 2 weeks. Therefore we will try to get through the next steps with Health Net within two weeks. ALTERNATIVE COVERAGE. Please continue to have alternative coverage in mind in case the Cobra or the injunction efforts are not successful. If you are not receiving OWA event announcements, we do not have your email address. Please email Sarka Volejnikova to update our records. Senator Speier, a vibrant, dynamic speaker and devoted public servant, is a leader among leaders. She served in the State Assembly from 1986-1996, and is serving her second and final term in the 8th Senate district, which includes the western half of San Francisco and northern San Mateo County. Please contact Katherine Burke, katherineburke@earthlink.net or Barbara Harris Chiang, bhc@dillinghammurphy.com or 415-397-2700 for more information. This will be a unique opportunity to honor the construction industry's pioneers, interact with our leaders and learn more about future opportunities. All facets of the construction industry will be represented, including Design & Contracting, Finance & Surety, and Dispute Resolution & Legal. Local and nationally recognized panelists, moderators, government leaders and keynote speakers will participate in the all day conference. Supported by Peckar & Abramson, P.C., the Construction Specifications Institute, S.F., the Construction Financial Management Association, the American Institute of Architects, S.F., the California Bar Association's Construction Law Subsection, and the National Association of Women in Construction. For Partnering, Exhibitor, and Sponsorship Opportunities, call Jeffrey Conner, 415-837-1968 ext. 4404. For Program and Registration information, call Faye Johnson at ext. 4415.